Flowering time and genetic memory. Flowering is a killer application of the natural world. There are 300,000 extant species of flowering plants, dwarfing any other type of plant. There are only several thousand species of other types of plants (about 15,000 mosses exist today– the next most abundant group of plants). To say flowers are an evolutionary success story is an understatement. Darwin called their evolutionary origins an abominable mystery, however, scientists since his time have figured out quite a lot about the origins of flowering plants from fossil evidence (http://www.indefenseofplants.com/blog/2015/2/5/an-abominable-mystery) as well as a still extant, but early, flowering plant known as Amborella. Amborella trichopoda, an early flowering plant. Source. Amborella can only be found on the island of New Caledonia, in the Southern Pacific Ocean. It has two kinds of flowers, one male and one female, which is a bit unusual in the plant world. Many flowers have both male (pollen producing) organs and female (ovule/egg producing) parts in a single flower. Amborella flowers can switch from male to female as well. Amborella may not be geared to attract a specific pollinator either, as many flowering plants are, but relies on wind to take pollen to female flowers, that then develop into seeds. While wind is still a strategy for many flowering plants as well as gymnosperms (i.e. confiers like pine trees), flowering plants have been successful largely because of a partnership with insects. Insects get nectar and flowering plants deposit pollen on insects that they then dust onto other flowers of the same (or similar) species to create the next generation of plants. It is remarkable that pollination works at all. With all of the insects, bats, and birds that spread pollen around, pollen has to get from one plant to another. Flowering has to be coordinated within a population so that plants have the chance to cross pollinate (some plants can pollinate themselves, but others have to have their pollen land on a compatible, other, individual plant. Flowers are designed in many ways to attract pollinators by look, scent, rewards, and trickery to attract the right pollinator. Some plants only flower every few years, or longer. And some plants, like some grasses or potatoes, can propagate vegetatively to produce a new plant from vegetative tissues (i.e. roots, stems, leaves). However, that is not all plants. I’m sure I’ll talk about some specific flower’s strategies for attracting pollinators in the future. For today, though, I’m going to talk about one way plants make the decision about when to flower. In temperate regions, where winters occur, some plants undergo vernalization, over-wintering, that is a pre-requisite to trigger flowering when a plant flowers. This cold treatment is required in some species, otherwise, the plant may not flower at all or will flower late in the season and miss reproducing. A question vernalization brings up is just how plants know they’ve over-wintered. What provides the memory of the winter within a plant’s cells? Although there are a lot of inputs into the flowering decision plants make, one critical factor is a gene called flowering locus C (FLC). The FLC gene codes for a protein that is able to turn on and off other genes. After seeds germinate, FLC is active (recall that genes can be turned on or off & everything between) and is a repressor of flowering. Over the winter, the level of FLC in a plant gets less and less as the winter goes on. 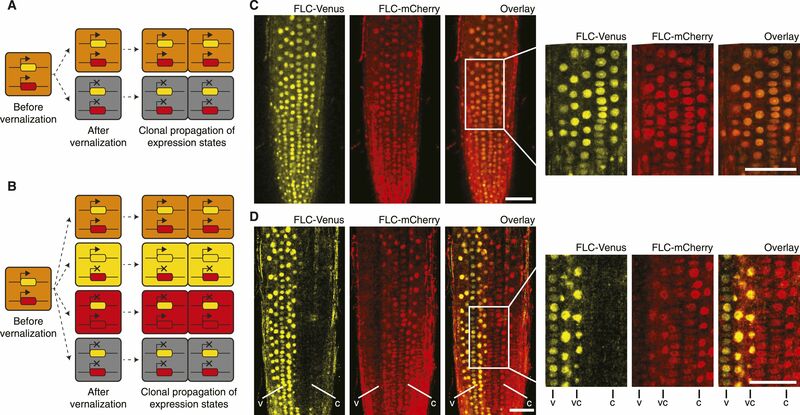 The gene that encodes FLC is turned off in many, if not most individual plant cells that will then transmit a mobile signal to the meristem to stop vegetative growth and begin the flowering process. In some plants, at least, it is sufficient to locally cool the area around the shoot apical meristem to induce flowering. However, in plants that require vernalization, the whole plant experiences it and each cell silences FLC or doesn’t. Depending on the strength of the cells voting to flower can determine when a plant will flower. This is good for coordinating a population that experiences a similar winter; they’re more likely to flower at the same time given a shared experience. So just how is FLC silenced? 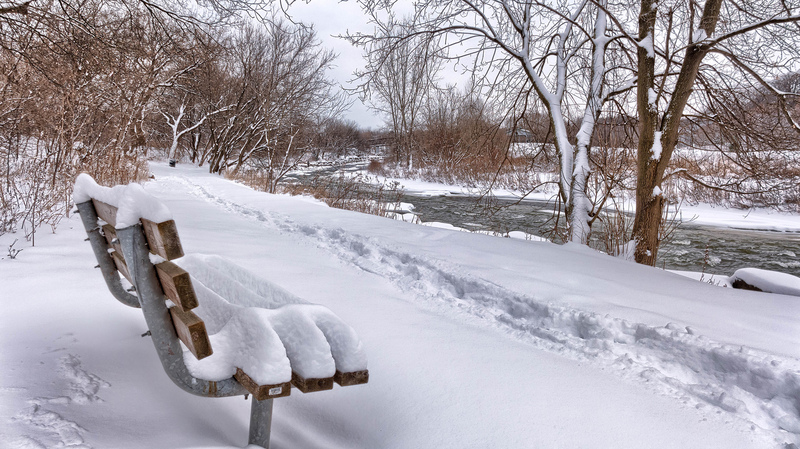 And how do plants remember they’ve experienced a winter? Epigenetics is part of the process cells use to determine what genes should be active or turned off under given conditions or development. The DNA in a genome can be directly modified by a process called cytosine methylation, basically adding a tiny chemical tag onto cytosine, one of the 4 bases that make up DNA. DNA in genomes is also wrapped around proteins known as histones. It’s a way to tightly package DNA in a small nucleus. Histones can also be modified with methyl groups and a few other kinds of molecules that signal how tightly packaged the DNA and histones are. The most tightly packaged DNA is in a silent, off state; inaccessible to the cell’s machinery that could activate the gene. This is what happens to FLC over the winter. The cold temperatures steadily cause a plant to reduce it’s level of FLC down to nothing after 10 weeks or so (depending on the plant, cold may cause more or less rapid reduction of FLC). A key thing to remember about epigenetic states is that they are heritable. In other words, when a cell divides, replicating it’s DNA, the epigenetic state of the daughter cells is maintained (often, though not always). This month in eLife, Berry et. al. from the John Innes Centre published a series of experiments trying to figure out the nature of epigenetic memory. As it is stably heritable through cell divisions, the state has to be transmitted to the newly made DNA strand that exists in each daughter cell. In principle, this could work a couple of ways. Memory of the epigenetic state might be stored locally, at the site of a specific epigenetic state and that gets transferred over to the new strand (this would be in -cis memory). It is also possible that the memory is maintained in some diffusible state, spread throughout the cell that then places an epigenetic mark where they’re supposed to go once it recognizes a specific place (an in -trans memory). After cell division (and DNA being inherited, one parental strand in each new cell), examples of cis and trans memory mechanisms of epigenetic inheritance. 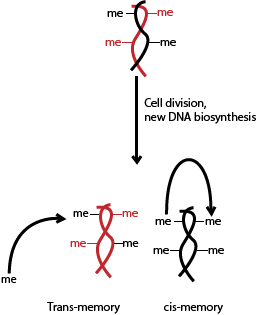 me = methyl group (epigenetic tag). To determine this, the scientists generated plants that had two copies of FLC in each cell, each in a distinct location in the genome and each functional– yes, like towns on maps or specs on blueprints, genes exist in specific locations. Each copy was tagged with a fluorescent reporter gene, one yellow and one red so they could track each copy of FLC simultaneously and independently. If the cis memory were the way plant cells handled epigenetic memory, then there should be individual sectors where one copy of FLC was silenced vs. another. If the in-trans model were correct, then the pattern observed would be more patchwork and random, with cells silencing of both copies of FLC in a given cell. Figure 3 from Berry et. al. 2015 showing models of cis and trans memory and the result in roots of non-vernalized (top) and vernalized (bottom) FLC expression. Note the independent silencing of one copy vs. another. source. What they observed consistently was that the -cis model was supported. Thus, the cellular machinery involved in FLC silencing is right next to where it acts. Memory is stored locally, not diffusing throughout the cell. By having two copies of a gene that is normally silenced and seeing patterns consistent with cis memory, it suggests that a future area of study needs to be just what all the factors are in maintaining a local epigenetic memory state. The interesting thing about FLC is that it’s an epigenetic memory that gets stripped away when seeds are produced, thus each new seedling starts out with a high level of FLC as it starts its life, only to be silenced by winter. That’s a neat trick and is a future direction for studying epigenetic modification and flowering time. Just what makes one local epigenetic silencing complex maintain its state vs. one that relinquishes epigenetic markers? Further, when passing epigenetic markers between generations, there are examples of ‘imprinting’, an epigenetic state that gets inherited. FLC is not one of them. Thus plants (& probably other organisms) can have both inherited and loss-of-epigenetic memories between geneerations. That’s a neat trick and is a future direction for studying epigenetic modification and flowering time. Just what makes one local epigenetic silencing complex maintain its state vs. one that relinquishes epigenetic markers? Vernalization is just one example of epigenetic memory. There are other epigenetic ways in which plant cells remember all sorts of things such as previous stressors. In the tropics, unless at high elevations, vernalization is not likely a strategy of flowering plants. But there may be other cues involving epigenetic memory that help plants coordinate and know when to flower with other plants of the same species for pollinators to continue creating the next generation of plants.